These four pieces belong to a series comprised of at least ten dealing with human redemption. The Vices and Virtues, a common theme in the 15th century, are also displayed here. Juan Rodríguez de Fonseca, Bishop of Palencia, owned eight of the tapestries, bequeathed in equal shares to his last two dioceses of Palencia and Burgos. 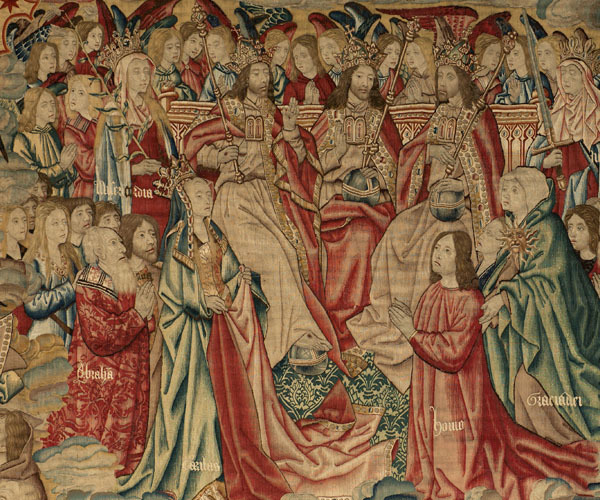 Woven in wool and silk, they were probably bought by the clergyman on his visits to Flanders as the special ambassador of the Catholic Monarchs to the court of Philip the Handsome. They were manufactured in Brussels workshops, and both the cartoonist and the weaver are unknown. They were probably not commissioned by the bishop, who most likely bought them already finished, because his coat of arms, which appears three times on the tapestries, is not interlaced but superimposed. 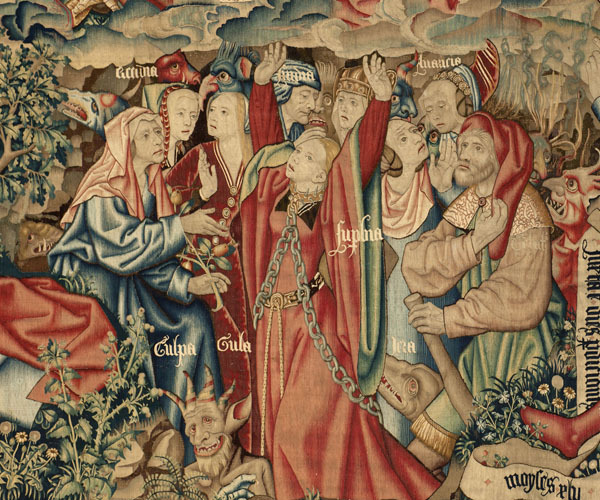 The four tapestries — ‘Vices Lead Man to Sin’, ‘Christ the Saviour as a Child’, ‘The Virtues challenge the Vices when Christ begins his ministry’ and ‘Christ Ascends To Heaven and Man is Redeemed before God’ — entered the cathedral on the 17th April 1527, by order of Castile’s comptroller, Antonio de Fonseca, who thus fulfilled the wishes of his late brother, the bishop, deceased three years earlier. 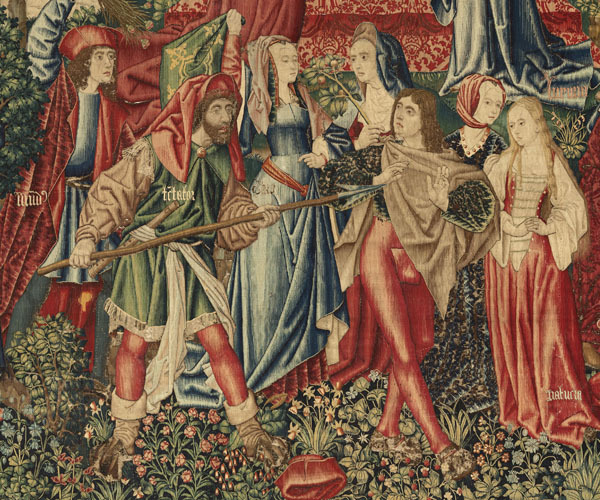 In an inventory of 1623 the tapestries are listed as ‘... four rich, large pieces eight metres long; they depict Old and New Testament stories. Each one has three escutcheons of [...] the Bishop Joan de Fonseca...’. They recount several Bible stories with many characters. This suggests that only three of them belong to the Stories of the Old and New Testament series, while the fourth refers to Vices and Virtues. However, there are no technical differences between them, and the series was originally probably comprised of at least ten tapestries. The series focuses on the redemption of humans by Christ and, by adding episodes on the struggle between the Vices and Virtues to the usual theme of the life of the Saviour, it clearly alludes to the difficulties experienced by human beings in achieving redemption. The tapestries are exhibited in the chapter house and are perfectly suitable for this space, even though not made for it; the chapter house had, in fact, acquired, in 1519, other tapestries on a similar theme of Vices and Virtues, which remained in the cathedral until their sale in 1935 to the media tycoon W. R. Hearst. After his assets were auctioned, they ended up in the Musées Royaux d'Art et d'Histoire in Brussels. 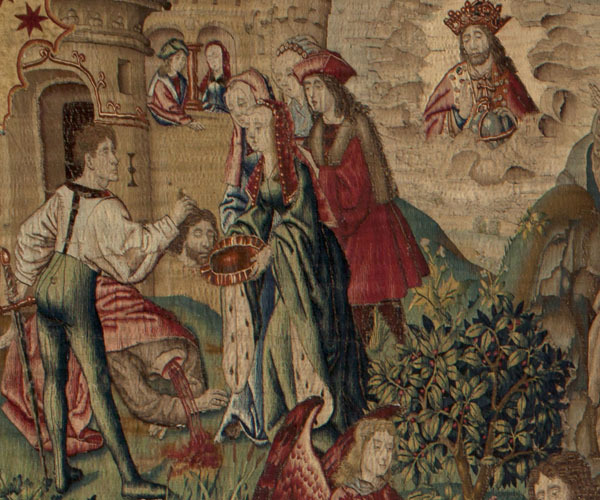 A. S. Cavallo, Medieval tapestries in the Metropolitan Museum of Art, New York, 1993, pp. 421-446. G. Ramos de Castro, “La tapicería del Antiguo y Nuevo Testamento”, in Las Edades del Hombre. Memoria y esplendores (exhibition catalogue), Palencia, 1999, pp. 136-144. M. Á. Zalama and M. J. Martínez Ruiz, “Tapestries of the cathedral of Palencia in the Musées Royaux d’Art et d’Histoire in Brussels: Bishop Fonseca, the sale of the canvases and the magnate Hearst”, Jaarboek Koninkijkmuseum voor Schone Kunsten - Antwerp Royal Museum Annual (2007), pp. 155-175. E. Antoine, “La Historia de la Redención del Hombre: una tapicería en busca de comitente”, in F. Checa and B. J. García, Los Triunfos de Aracne. Tapices flamencos de los Austrias en el Renacimiento, Madrid: Fundación Carlos de Amberes, 2011, pp. 95-116. Fabric Silk and wool, 7 warps per cm.